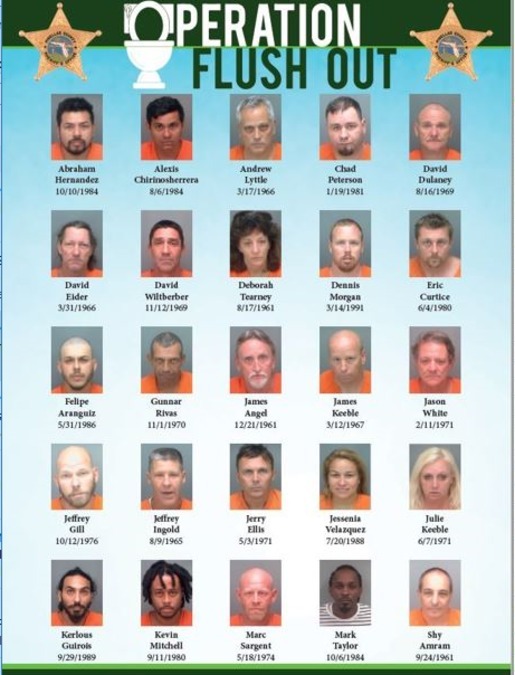 ST. PETERSBURG, Fla. — Nearly 30 people are behind bars Monday after being arrested by the Pinellas County Sheriff in an undercover unlicensed contractor sting, named "Operation Flush Out." The Pinellas County Sheriff used undercover deputies to make the arrests. They advertised on apps like Next Door and Craigslist stating that they needed services ranging from drywall to painting to framing at an empty storefront at 2705 54th Avenue North in St. Pete. Sheriff Bob Gualtieri says every single contractor that showed up looking for work was unlicensed and uninsured. Some even agreed to do the work without pulling permits. One of the contractors already had four warrants out for their arrest. Another told undercover detectives he would work on the weekend and cover the windows of the shop to avoid pulling a permit for the work. The sheriff says the illegal contractors are knowingly committing crimes and are ripping off residents in Pinellas County. “If we catch you, you’ll pay the price,” Gualtieri added. Antonio Signoretti watched all weekend as people went in and out of the empty shop just two doors down from his tattoo parlor. Signoretti was unaware that deputies were using the shop to bait illegal contractors. "I was taken back by it, but I believe what comes around goes around and I hope these people learned their lesson," he explained, "If you're going to do something, do it right." Gregg Longkey also works in the strip mall where the sting operation took place. He's glad deputies made these arrests. “I know I’d be mad if I hired someone and they didn’t pull through especially since they are advertising their services online. That's not cool," he added. The sheriff’s office plans to conduct more stings in the future targeting other areas of Pinellas County. To make sure a contractor you plan to hire has a license in Florida, click here .